I am not supposed to show any cat-favouritism to my beautiful, photogenic, white cat called B-Puss. But I thought I'd get away with popping this beautiful photograph into the Moosey Garden Tour. B-Puss is resting by the catmint, or Nepeta, which grows along the house path. My cats ignore it for weeks, and then the catmint will be rediscovered, and promptly sat on, hidden in, or sometimes chewed on. 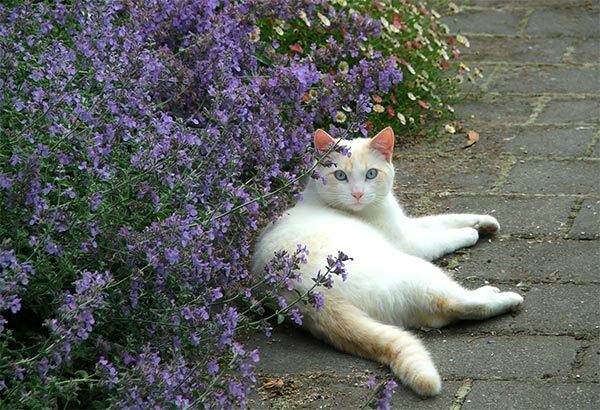 It's my classic informal edging plant, and I love the colour of the flowers - they almost match B-Puss's beautiful blue eyes.